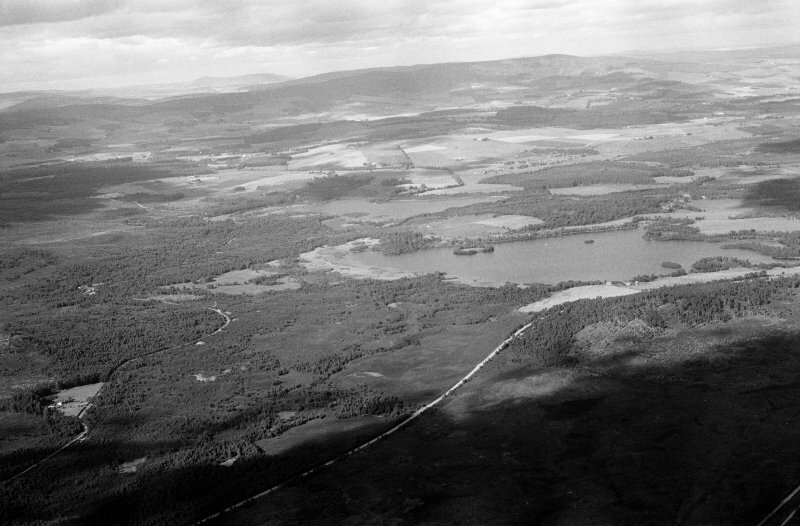 General oblique aerial view of Loch Kinord with Loch Davan beyond, looking to the NNE. 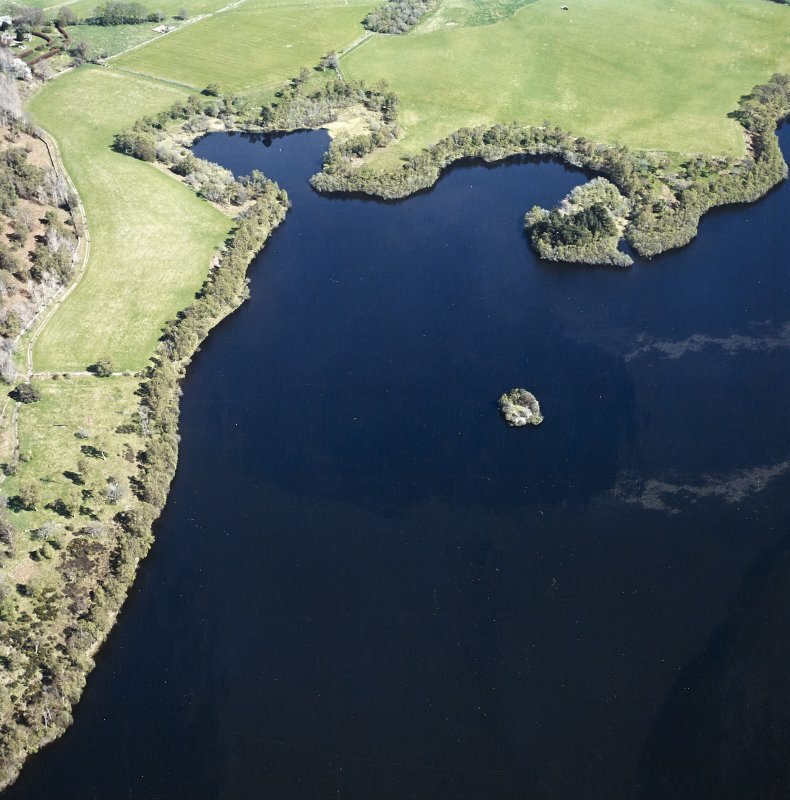 Oblique aerial view centred on the remains of the crannog, taken from the WSW. 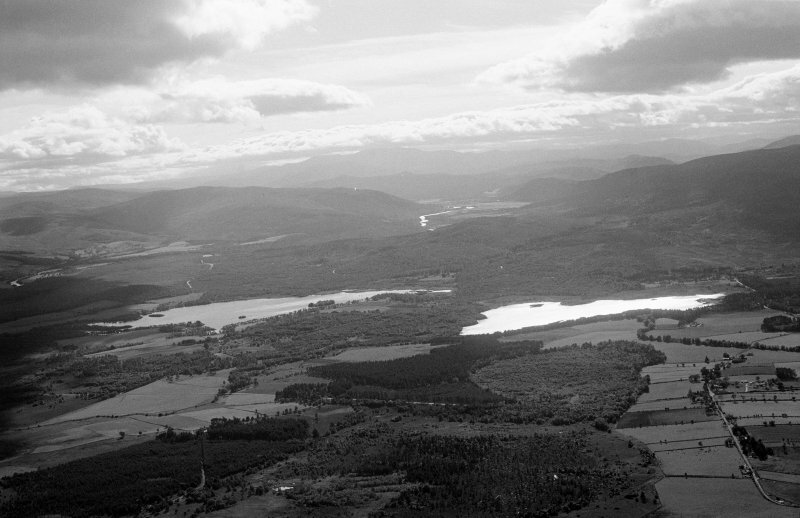 Oblique aerial view centred on the remains of the crannog, taken from the W.
General oblique aerial view of Loch Kinord and Loch Davan beyond, looking to the SW.
OS 6"map, Aberdeenshire, 2nd ed., (1902). A small circular island believed to have been used as a prison for the nearby castle (NO49NW 16). There can still be seen wooden stakes driven vertically into it. A wholly artificial crannog 25 yards by 21 yards and 8 1/2 feet high, formed by oak piles with interlacing horizontal beams and stone infilling It is now overgrown. It pre-dates the nearby castle, but it has probably been enlarged during the time the castle was occupied. It is believed that it was used as the prison of the castle. A crannog now measuring 20.0m by 14.0m and 1.2m in height consisting of small boulders. No oak piling nor any other artificial features can be seen. Visited by OS (N K B) 15 November 1968. NO 44350 99523 This work was carried out, 7–8 March and 16–31 October 2015, as part of a wider project investigating crannogs in NE Scotland and forms a large part of the author’s PhD research. 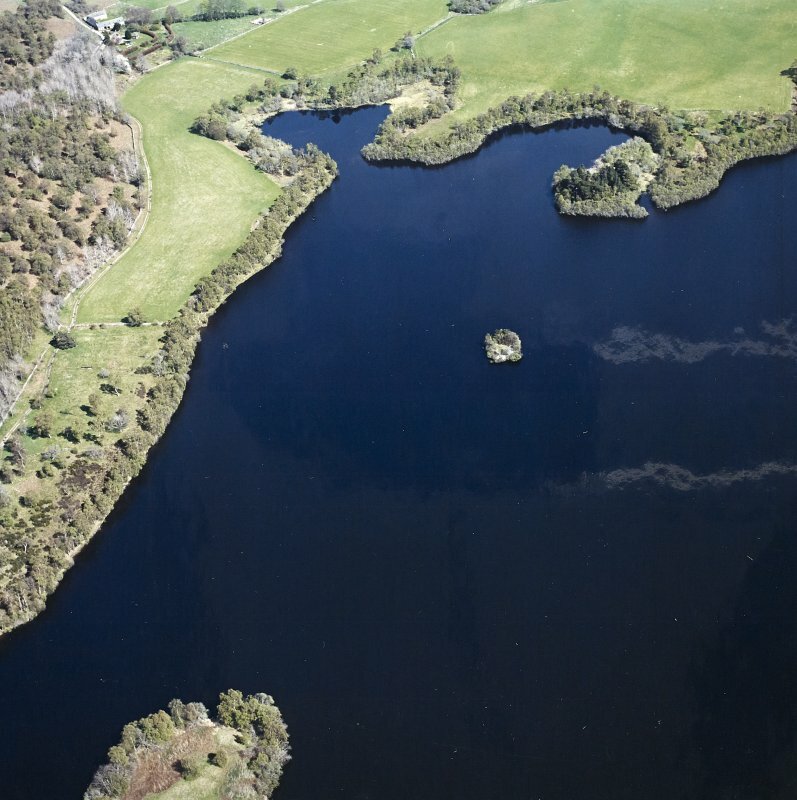 A submerged survey was undertaken of Prison Island, Loch Kinord, in March and measured the extent of the rubble matrix that makes up the crannog. The visibility conditions in the loch were exceptionally poor, limiting the features identified to the rubble matrix only and two horizontal timbers. One of these timbers, located on the S side of the crannog, in 1.6m of water and emerging from the rubble matrix, was sampled and radiocarbon dated. The sample returned a date of 925±30 BP or cal AD1026–1170 and AD1176–1182 (95.4% probability – Poz–72879). In October, the opportunity was taken to return to Prison Island to excavate a 1 x 1m trench to test if there were surviving archaeological deposits above the waterline. It was discovered that only a peaty soil survives above the waterline between the stones which make-up the rubble matrix of the island. Below the waterline, the trench revealed in situ charcoal-rich deposits which were sampled. A fragment of charred roundwood was identified and will be sent for radiocarbon dating.